5/8" pin fits all Class III, IV and V receiver hitches. 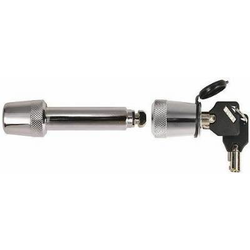 This version of the T3 features 100% stainless steel and provides instant security for your camper, boat or trailer by securing your vehicle receiver hitch. Features patented 1/4 turn technology that cannot be false locked. Width between heads (exposed pin length or gap space) is 2 5/8"